With the running festival arriving in Les Contamines on Friday we decided to try one more hike on Thursday before moving on, this time heading towards the Glacier Tre de la Tete which extends down from the higher mountains to around 2000m at a refuge built close to it's head. 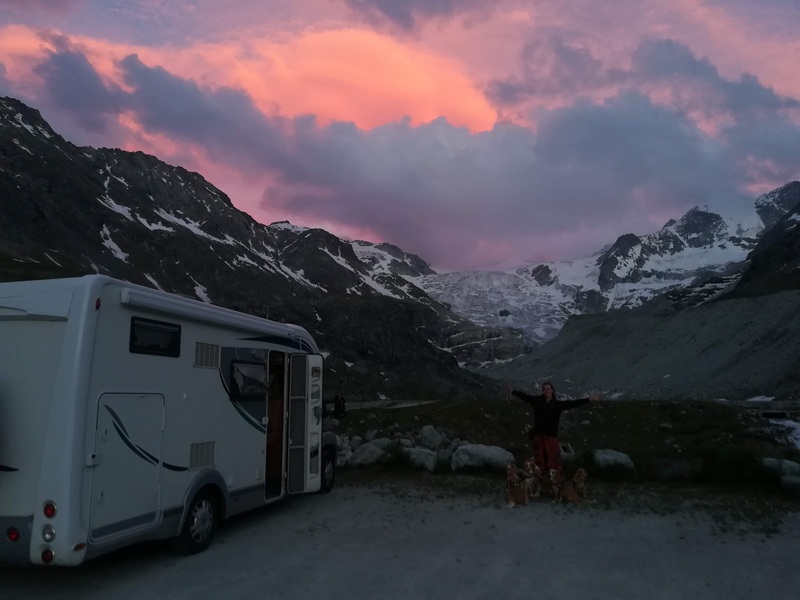 This trail, which branches off from the more well trodden Tour de Mont Blanc (TMB) sections, provides a fantastic opportunity to walk a circular route while getting away from the bulk of other hikers. It also provided us with a new perspective, looking west and away from the Mont Blanc Massif to the surrounding hills we had been hiking during the previous week, including Mont Joly. Setting off from Les Contamines we once more walked through the recreation area on our way to Notre-Dame de la Gorge where we picked up the GR5/Tour de Mont Blanc. Climbing steeply to the Refuge du Nant Borrant (1459m), initially retracing the route we had taken to the Col de la Croix du Bonhomme, at the refuge we veered left onto a new trail. From here we followed another steep ascent on a loose surface that was hard work. The trail primarily stayed within wooded sections of mountainside, but frequently passing openings in the trees to reveal the spectacular scenery of the valley in the morning sunshine. We worked up a good sweat on the climb and in just 1 ½ hours we arrived at the Refuge de Tre-la-Tete. Positioned on a rocky outcrop overlooking the valley below we paused briefly in the warmth of the late morning and appreciated the panorama we had ascended to. By setting off early we had seen few people on the trail and felt glad to be able to enjoy the scene in relative isolation. On our right, as we arrived, we could make out the opening of the valley that would lead up to the Glacier Tre-la-Tete and decided to follow the section of trail marked 'difficult' that would climb up alongside the glacier towards the Refuge des Conscrits (2610m). As we progressed onwards and upwards the path narrowed and began to take in several very steep and fixed rope sections as well. The view of the glacier which was just swinging into sight was impressive, with heaps of scree opening up to reveal the blue ice beneath. After an hour of ascending the tricky path it was clear that Esther's recent fall on Col de la Croix du Bonhomme was causing discomfort. Knowing that another slip might make Esther's injury even more painful we decided to turn around at 2300m, having enjoyed a breathtaking view of the glacier surface tumbling down a near vertical section of cliff. We did speak to several other groups who had continued up this trail all the way to Refuge des Conscrits (where they had spent the night) and we would definitely like to try this ourselves in future. Sitting back at the Refuge de Tre-le-Tete preparing our lunch in the sunshine, we said one final goodbye to the surrounding hills and valleys that had been our base for the past week, in the shadow of Europe's highest mountain. After packing away our stove we began making a longer and gentler descent northwards on several trail sections that led towards the Oratoire Saint-Antoine and the recreation area below. From here we completed our final hike from Les Contamines, making our way back to our motorhome to begin packing up our well used hiking gear ready to move on once more.